The main thrust of systems@work 6.1 has been to transfer, into browser technology, all data maintenance functions needed on a day-to-day basis for the operation of time@work, expense@work and forms@work. The configuration of the system (generally consultants’ work) remains, to some extent, a client-server task, but in due course we will also rewrite all system configuration functions in browser technology. We believe that the product is now enabled for Cloud deployment and in the coming weeks we plan to create and market preconfigured (Ready to Go) systems on a Software as a Service basis, whilst offering additional configuration services (Tweak It) and full classic implementations (Start from Scratch). We are launching our Cloud strategy with the slogan Convenience without Compromise. The use of cloud services need not mean accepting the lowest common denominator when it comes to functionality and configurability. A single instance of a time@work application server can support multiple radically different configurations of the product for any number of clients. We hope to involve Resellers, too, in the marketing of our new systems@work Cloud services. For existing users of systems@work software there is no need to abandon the systems@work Maintenance application for data maintenance since we allow access to these functions through an alternative Access Profile (details from systems@work Support). However, new functions in coming versions of systems@work will be written only for the browser. We’ve moved most data maintenance functions from the systems@work Maintenance application to the browser-based Professional Services Workbench (PSW), and we’ve provided an easy Excel-based data export-import mechanism so that data maintenance and modification can be done easily and in bulk. As long as columns in an Excel spreadsheet can be mapped to field-names in systems@work new records can be imported and existing records updated – subject to employee permissions. We’ve also provided an Administrator Console that includes diagnostic information and links to administrative functions. End-users may now also create and/or modify data dictionaries, translating or substituting their own terminology for existing terminology (e.g. ‘Client’ to ‘Customer’, or ‘Project’ to ‘Case’) using a Find and Replace function. Again, this puts control into the hands of end-users. We have extended options for data modification in all invoice worksheets, including calculations (subject to permission). We have provided a new function – Write Off – which allows for the writing off of time and expense transactions that are marked as not to be invoiced. We have introduced a new ad-hoc invoice function. You no longer need Work in Progress in order to initiate invoicing. We have introduced a Credit Note function, effectively the converse of the ad-hoc invoice function, in addition to the existing Reversal and Correction functions. We have enabled links to subreports and documents in all invoice worksheets. We have enabled a ‘silent processing’ mode for time@work Maintenance Multiple Invoicing so that users need no longer click multiple confirmation dialogues. The Project Portal (also a starting point for Invoicing) may now, optionally, show Work in Progress value and time. We have introduced a new type of Analysis Definition – URL. Whether linked to an Employee, Client, Project or Task record, or present in an Activity Analysis value on a Timesheet, Form or Invoice, such fields are interpreted automatically as links to an external web page. We have allowed the definition of a fixed-width for Item view. This ensures that in Item View the appearance of a form is unchanged by different resolution settings. We have enabled the prefilling of default currencies where specified on a calculation. We have extended return options to allow that a form can be returned to an authoriser or employee despite validation errors. We have extended selection criteria to include Export Sequences. We have removed the runtime parameter page. We have provided fields for the specification of payment instructions and additional data, such as tax registration data, on the Company record so that these data can be included in invoices. All multi-click file upload dialogues have been replaced with a drag and drop control. In particular the attaching of a file to a form is greatly simplified. Oversized images are now automatically resized to a specified maximum resolution and stored as JPG. Subreports are now available in the Ledger Modification grid. Grids now enable filtering and grouping. Calculation values may be modified. You may now specify that overdue timesheets are automatically opened on Login. You may now suppress Tasks by Timesheet Type. We have right-aligned numeric values in Active Schedules. We have modified the Posting Algorithm so that Timesheet Period, when not explicit, is derived from Transaction Date. We have continued to make improvements to the appearance of the PSW, modifying fonts, and colours to achieve a lighter look. This work will continue (as fashions change, indefinitely!). We have added to Timesheets and Forms a graphical representation of prior workflow. 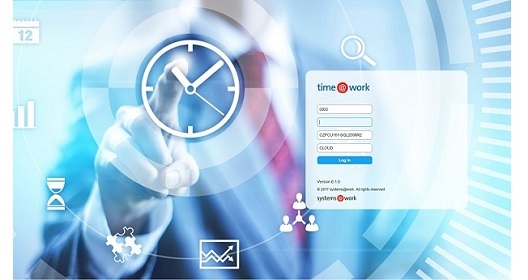 time@work 6.1.0 will go into production use at selected user sites and will be followed within three weeks by time@work 6.1.1, expense@work 6.1.1 and forms@work 6.1.1. Work continues on the rewrite of the systems@work App into Xamarin technology (one source code for iOS, Android and Windows Mobile). We hope to release this before year-end. In the meantime the latest version of the iOS and Android Apps remain forwards compatible with systems@work 6.1. The time@work Reference Guide will shortly be available on the Customer Web, together with the systems@work Installation Guide and a list of bugs fixed in 6.1.0.